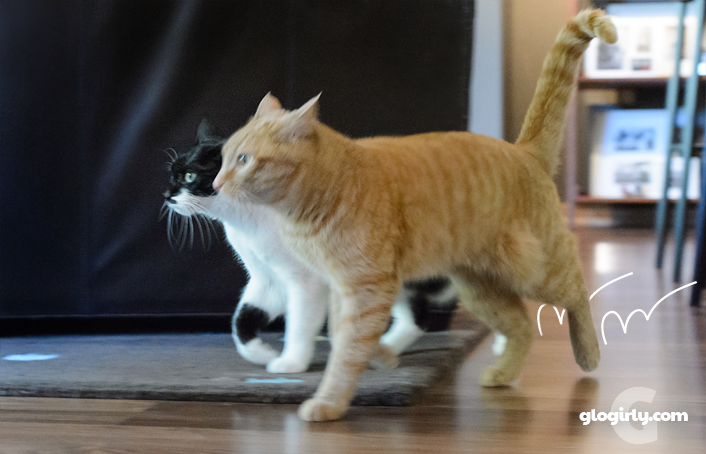 WAFFLES: Boss, we're not late, are we? WAFFLES: What if we missed breakfast? What are we going to do? KATIE: We'll likely starve to death, Waffles. Did you not hear your alarm this morning? WAFFLES: No. Gloman's out of town. How am I supposed to know when to get up if he's not here? KATIE: Well for starts, you could wake up Glogirly. KATIE: You were sleeping on her pillow again, weren't you? KATIE: Waffles, every time you sleep on her pillow she ends up oversleeping. And you know what that means, right? WAFFLES: Uh, we have to do the emergency broadcast thing? KATIE: This is not a test, Waffles. We need to wake her up STAT. 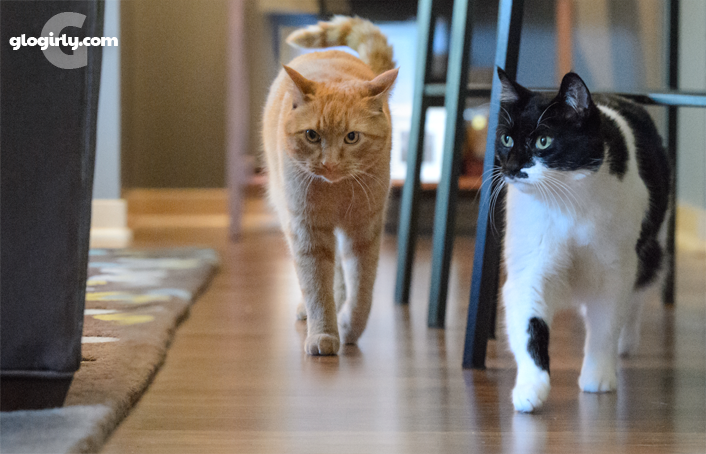 Every morning and every evening, just before breakfast and dinner, Katie & Waffles meet up in the kitchen to watch over each step of the meal-prep process. From the opening of the refrigerator and food containers to the sliding of the kitchen drawer and clinking of the spoons, they're right there watching every move. Before any food is served up, Glogirly has to retrieve the empty dishes from the night before. Katie's dish sits on the floor right next to the kitchen cabinets, but Waffles' is on the other side of the fireplace room on top of the cat tower. First Glogirly picks up Katie's and sets it on the counter. Then she heads over to retrieve Waffles' empty dish. 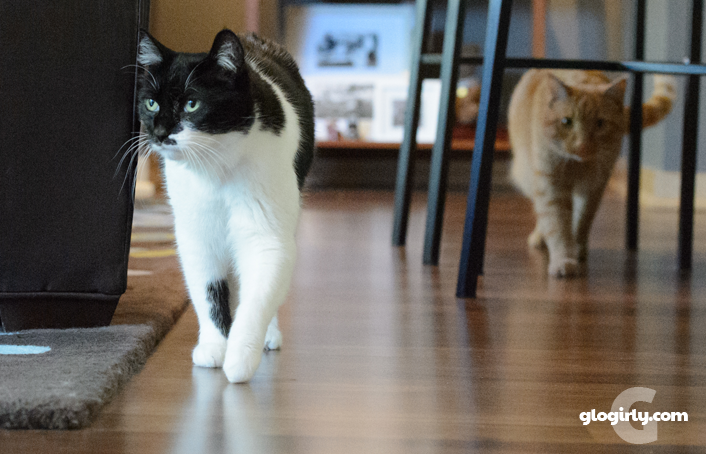 And every single time, Katie and Waffles are like Indy pace cars, leading the way. 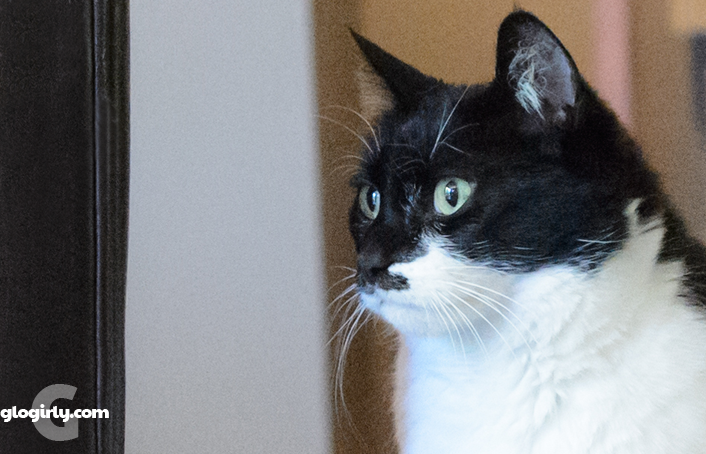 It's that trek over to the far food dish you're seeing in today's photos. And in case you were wondering, we have plenty of crashes on the racetrack. Hope ya got for breakfast! They have to make sure you do it right! After all, you're only human, you are not to be trusted alone with such important things as breakfast! Sounds better than our routine, where Binga smacks me just because she gets hangry! Breakfast is very important and Mum needs to be supervised so that we get equal shares. Hope you got breakfast after all this excitement! Maybe you can get an extra treat?!? You don't wanna be late for breakfast...or any meal for that matter! Well they wouldn't want to miss breakfast! Z-Girl calls us the Alarm Cats. She doesn't use the alarm clock anymore. We love to see the Indy Races at the Townhouse! Hoping that you didn't come close to starving! It stinks to have your schedule changed without notice! Oh no.....thank COD you didn't starve! We kitties never, never want to miss a meal do we? That's too, too funny. Around here, Marcus oversees everything. He makes sure the cats don't steal anything out of the dog food bowls, especially his. And he stands guard while the bowls are passed out. He knows which bowl is his, so paws off!. By the time he's done, the cat food bowls are ready to be passed out - often at different spots around the house. (The cats won't always eat at the same "table". ) So he follows the bowls to see the cat food is properly dispersed. Meal times are interesting. My guy, Sam, oversees (with plenty of vocal encouragement for me to hurry it up already) the food dishing-out process at every feeding, the food-carrying-out process, and scrutinizes the placement of his bowl Very Closely by putting his head into it as soon as he's able to push it down to the floor as quickly as possible. He'd scrutinize the placement of my other cat Maya's bowl as well, but he's busy Hoover'ing down his meal to make sure it's up to standards and can't take on other assignments until he's done. Maya eats in a separate room--behind a closed door--so Sam doesn't shove his nose into her bowl to "taste test" her food for himself. I am always greeted by Pumpkin the Farm cat sitting in front of the food bowls. MEOWING. And I had better step to! That was worrying that you might have been too late for breakfast. Aaaaaaaw How adowable. We do da very same fing. Gotta watch mommy and make sure everyfin' be even and nokitty be gettin' a bigger portionn or nuffin'. MOL Have a gweat weekend. I just keep singing to mum, hurry up and get me my foods. Is that a Code 47? Or is that a 53? Or a 10-100? STAT! STAT! OMC! Breakfast is late and she’s taken pictures??? You both look so intense!